The smell of yeast always brings me back to when I was little. My father made the most delicious French bread, and he used a super cool yeast thermometer that I always considered to be somewhat magical. Other than helping him out occasionally ("helping" as in "probably hindering in some way"), I'd never baked with yeast before. So, yet again, TWD is helping me break new ground! 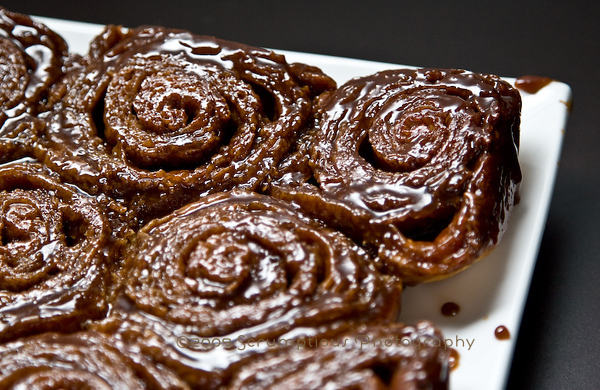 Madam Chow chose Pecan Honey Sticky Buns this week, and man, were they delicious. The brioche dough was a pretty interesting experience. The dough hook on my KitchenAid finally got broken in, and did it ever! The machine was dancing all around while the dough was coming together. I was a little nervous, but it finally did come together into a ball. During the rising period, I got a bit worried when little pools of butter began to form around the edges. For some reason, my apartment tends to be inordinately hot. I had to open a few windows and then the dough started looking OK again. After the overnight chill, I froze the other half of the brioche recipe for a rainy day and got down to business rolling out the cinnamon buns. Roll them out... then spread MORE butter on top (unbelievable amount of butter in this recipe), and then the cinnamon sugar. My glaze (sans pecans, since A. and I both think they ruin a good sticky bun) was already melted and waiting in the pan. After they rose and then baked, I flopped them out onto the serving plate and... voila! Yummy, gooey sticky buns. Sooo delicious. 1/2 recipe dough for Golden Brioche loaves (see below), chilled and ready to shape (make the full recipe and cut the dough in half after refrigerating it overnight). Generously butter a 9-x-13-inch baking pan (a Pyrex pan is perfect for this). Note: I used a nonstick 9x13 baking pan. To make the glaze: In a heavy-bottomed saucepan, bring the brown sugar, butter, and honey to a boil over medium-low heat, stirring frequently to dissolve the sugar. Pour the glaze into the buttered pan, evening it out as best you can by tilting the pan or spreading the glaze with a heatproof spatula. Sprinkle over the pecans. To make the filling: Mix the sugars and cinnamon together in a bowl. If necessary, in another bowl, work the butter with a spatula until it is soft, smooth and spreadable. 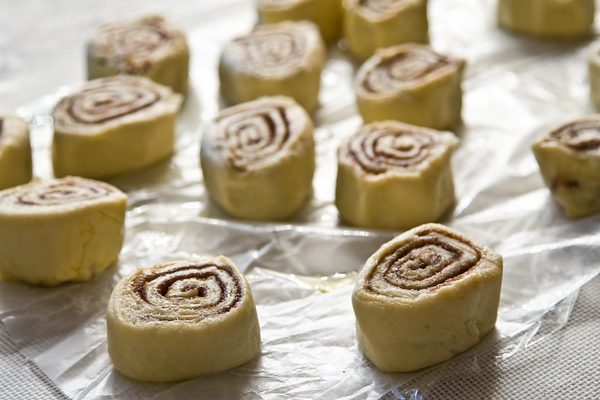 To shape the buns: On a flour-dusted work surface, roll the chilled dough into a 16-inch square. 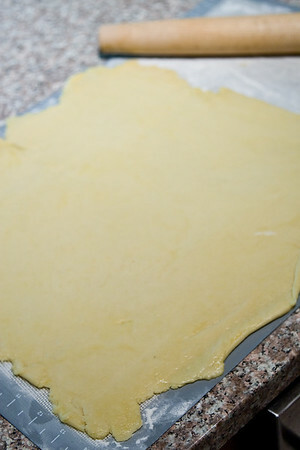 Using your fingers or a pastry brush, spread the softened butter over the dough. 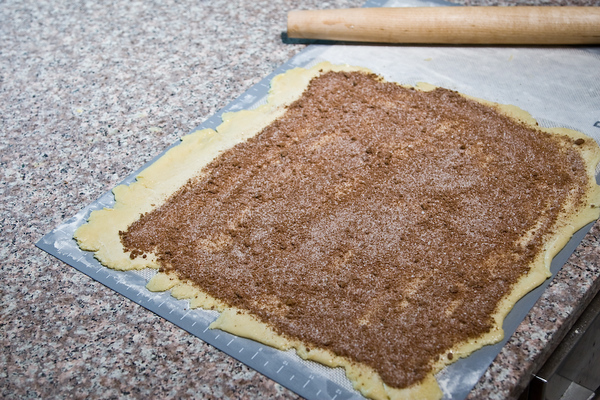 Sprinkle the dough with the cinnamon sugar, leaving a 1-inch strip bare on the side farthest from you. Starting with the side nearest you, roll the dough into a cylinder, keeping the roll as tight as you can. (At this point, you can wrap the dough airtight and freeze it for up to 2 months. Or, if you want to make just part of the recipe now, you can use as much of the dough as you'd like and freeze the remainder. Reduce the glaze recipe accordingly). With a chef's knife, using a gentle sawing motion, trim just a tiny bit from the ends of the roll if they're very ragged or not well filled, then cut the log into 1-inch thick buns. (Because you trim the ragged ends of the dough, and you may have lost a little length in the rolling, you will get 15 buns, not 16 Note: I still got 16.) Fit the buns into the pan cut side down, leaving some space between them. Lightly cover the pan with a piece of wax paper and set the pan in a warm place until the buns have doubled in volume, about 1 hour and 45 minutes. The buns are properly risen when they are puffy, soft, doubled and, in all likelihood, touching one another. Getting ready to bake: When the buns have almost fully risen , center a rack in the oven and preheat the oven to 375 degrees F Note: I heated to 350 F since my pan had a dark finish. Remove the sheet of wax paper and put the pan on a baking sheet lined with parchment or a silicone mat. Bake the sticky buns for about 30 minutes, or until they are puffed and gorgeously golden; the glaze will be bubbling away merrily. Pull the pan from the oven. The sticky buns must be unmolded minutes after they come out of the oven. If you do not have a rimmed platter large enough to hold them, use a baking sheet lined with a silicone mate or buttered foil. Be careful - the glaze is super-hot and super-sticky. To Make The Brioche: Put the yeast, water and milk in the bowl of a stand mixer and, using a wooden spoon, stir until the yeast is dissolved. 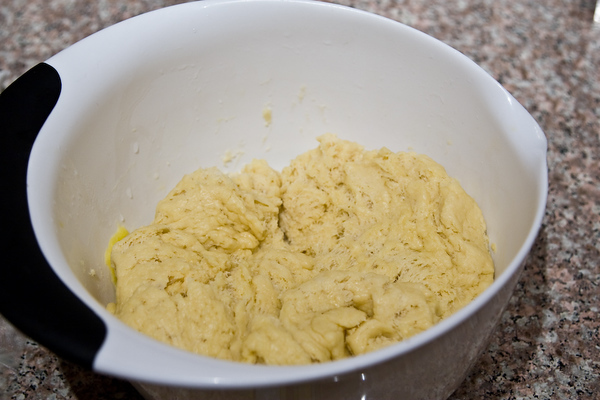 Add the flour and salt, and fit into the mixer with the dough hook, if you have one. Toss a kitchen towel over the mixer, covering the bowl as completely as you can-- this will help keep you, the counter and your kitchen floor from being showered in flour. Turn the mixer on and off a few short pulses, just to dampen the flour (yes, you can peek to see how you're doing), then remove the towel, increase the mixer speed to medium-low and mix for a minute or two, just until the flour is moistened. At this point, you'll have a fairly dry, shaggy mess. Scrape the sides and bottom of the bowl with a rubber spatula, set the mixer to low and add the eggs, followed by the sugar. 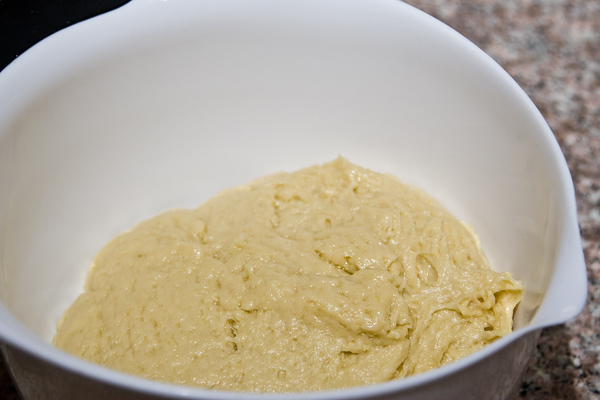 Increase the mixer speed to medium and beat for about 3 minutes, until the dough forms a ball. Reduce the speed to low and add the butter in 2-tablespoon-size chunks, beating until each piece is almost incorporated before adding the next. You'll have a dough that is very soft, almost like batter. Increase the speed to medium-high and continue to beat until the dough pulls away from the sides of the bowl, about 10 minutes. 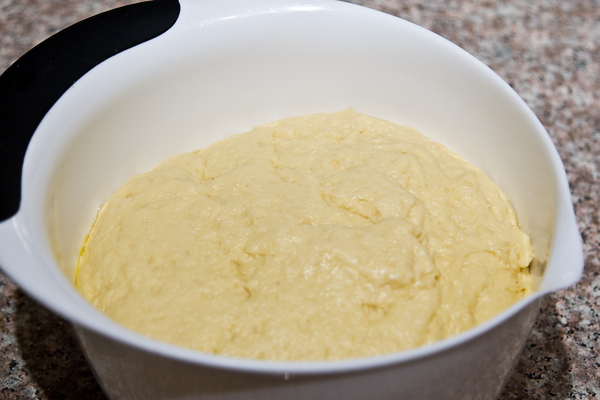 Transfer the dough to a clean bowl (or wash out the mixer bowl and use it), cover with plastic wrap and leave at room temperature until nearly doubled in size, 40 to 60 minutes, depending upon the warmth of your room. The next day, butter and flour two 8 1/2-x-4 1/2-inch pans. Getting Ready To Bake: Center a rack in the oven and preheat the oven to 400 degrees F.
To Make the Glaze: Beat the egg with the water. Using a pastry brush, gently brush the tops of the loaves with the glaze. Bake the loaves until they are well risen and deeply golden, 30 to 35 minutes. Transfer the pans to racks to cool for 15 minutes, then run a knife around the sides of the pans and turn the loaves out onto the racks. Invert again and cool for at least 1 hour. As always, check out all of the other entries over at TWD! Coworkers can't complain too much - those look delicious! Scrumptious indeed - love the photos! Love those little caramel dribbles off the plate. Delicious! wow, your sugary stickiness looks so yummy with its dark color. great buns! I wouldn't say no to day old sticky buns! They are beautiful and I love the pics! Not a single complaint was uttered. Aside from looking delicious, they tasted simply heavenly. they are beutiful with the dark brown sugar glaze! 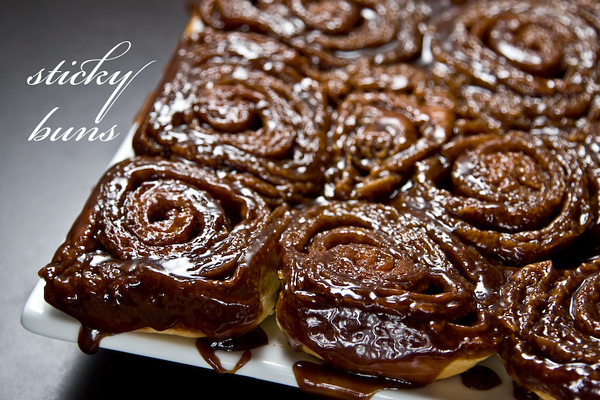 Beautiful sticky buns! I love the dark glaze. Must be the dark brown sugar? holy decadent yummy goodness, those look insanely good. everyone's photos look good, but that first shot, i think i drooled a little. FAB ! Good gravy, your buns looks divine! Well done! i wouldn't say no either....mmmm. I love your little video, so cool! And your sticky buns turned out great! Day after anything home-baked is better than anything "fresh" from a package! I'm sure your coworkers weren't complaining! Those look yummy! @katrina & bakersbakery, i do think the dark color is from the dark brown sugar, since everyone else's seemed to be much lighter in color. but dark is all i had on hand, so there ya go! @CB, karen & lyb, i'm glad you liked the video ;) i just thought it was so cool to "see" them rise, hehe. oh...those look like killer buns! so delicious! Great job! My serving plate will not stay that full if I had sticky buns on them. I tend to agree about omitting the pecans - too much of a good thing, I think! I say the more color, the more flavor! My husband shares your philosophy about nuts ruining a good sticky bun. His half of the pan had no nuts, and mine had extra. holy smokes that looks sexily good! yummy. Wonderful step-by-step photos - I love it when bloggers do that! And the video made me want to whip up another batch! Those look delicious! The color is beautiful. Nice swirls. Great pics of the dough. Beautiful pictures of scrumptious buns! I got a bit worried as well when I saw the butter pooling as the dough rose. I didn't think about how warm my kitchen was, though. I just ignored it and proceeded onwards. Whoops! Those sticky buns look so good! Great looking sticky buns. Loved the video clip. Your buns looks so beautiful! Thanks for the link to the gf pancakes on my blog. For some reason it got put into moderation and I jsut found it, but they look fabulous! You are a photo goddess! I always love your pictures. Fabulous buns! You're photos really are fantastic!